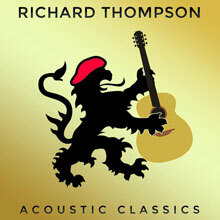 New Release - Richard Thompson 'Acoustic Classics"
Acoustic Classics, a collection of newly recorded timeless Richard Thompson songs, features 14 tracks culled from his 40 year plus music career. For the ﬁrst time ever, acoustic versions of songs like “I Want To See The Bright Lights Tonight” and “Dimming of the Day” mingle with cornerstone classics like “1952 Vincent Black Lightning” and “Beeswing” as well as other acoustically rendered gems. "I really wanted to have something that would reﬂect the acoustic shows, "Richard explains, "But we didn't have anything like that. Just some old, slightly scratchy recordings of solo sets that I wasn't really happy with." His last proper solo acoustic release was the live Small Town Romance, and that was more than 30years ago! In the meantime, the acoustic shows have evolved as a full parallel to his band tours. Thompson was named by Rolling Stone Magazine as one of the Top 20 Guitarists of all time and considered one of the UK's most outstanding songwriters and musicians. The recipient of a BBC Lifetime Achievement Award, Mojo's Les Paul Award and curator of the prestigious Meltdown Festival at the Southbank in 2010, Thompson was most recently honoured with a Lifetime Achievement Award for Songwriting by the American Music Association.